The Trojans golf team finished in fourth place at the Division I-A state golf championships in Truckee, California on Monday and Tuesday. The teams battled fierce 30-mile-an hour winds up by Lake Tahoe both days of the tournament. Trojans coach Bob Hopkins said it was so cold he had his heater on full blast the whole tournament. “We had the cover on the cart and the wind blew us around like a kite,” he said. 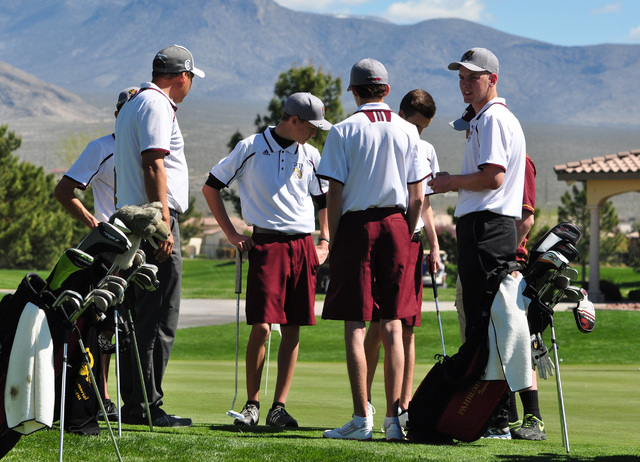 Pahrump (904) finished behind the winner Faith Lutheran (811), Elko (870) and Boulder City (877). Last year the team finished in fifth place on their home turf at Mountain Falls. This was the second win in a row for Faith Lutheran. Trojans golfer Austen Ancell led his team with a 6-over-par 150 and he took the individual state championship. Ancell was behind former state champion Luke Logan by 4 strokes after hole 13 on the last day. Ancell then battled back and birdied four of his last holes to win over Logan by two strokes (see front page story). “This was the best tournament play for me all year long,” Ancell said. Six teams, three from the north and three from the south qualified for the tournament held at Old Greenwood Golf Course the first day and at Grays Crossing Golf Course the second. With individual qualifiers, the tournament saw 48 participants. The three Northern teams were Lowry, Elko and Spring Creek and the three Southern teams were Faith Lutheran, Boulder City and Pahrump. The Trojans team was composed of sophomore Ancell and juniors Derrek Moore, Drake Asuncion, Kelby Lindberg, Mike Hildebrand and Canen Hastings. The team’s overall performance on the second day was disappointing to Hopkins, because they shot 32 strokes worse than on Monday.